The groundhog saw its shadow, so we get six more weeks of Maximum Crisis rulings. Q: Performapal Sky Magician is face-up in my Monster Zone, and a Magician’s Left Hand is face-up in my Spell & Trap Zone. In this situation, my opponent activates Brain Control. If I chain the effect of Performapal Sky Magician, and activate a Magician’s Right Hand with its effect, what happens? A: In this scenario, when the effect of Performapal Sky Magician resolves as Chain Link 2, Magician’s Left Hand on the field is returned to the hand, and Magician’s Right Hand is activated. When Brain Control resolves as Chain Link 1, the effect of Magician’s Right Hand is applied, so Brain Control has its effect negated and is destroyed. Q: I activate the effect of Fairy Tail – Kaguya, targeting a face-up Kozmo Dark Eclipser on my opponent’s field. If Book of Moon is chained to this effect, and Kozmo Dark Eclipser is changed to face-down Defense Position, can my opponent still negate the effect of Fairy Tail – Kaguya by sending another copy of Kozmo Dark Eclipser from their Deck to the Graveyard? A: In this scenario, if the targeted Kozmo Dark Eclipser is changed to face-down Defense Position by the effect of Book of Moon, your opponent is not able to negate the effect of Fairy Tail – Kaguya by sending another copy of Kozmo Dark Eclipser from their Deck to the Graveyard. In this case, since the effect of Fairy Tail – Kaguya is not negated, both it and the face-down Defense Position Kozmo Dark Eclipser are each returned to their owner’s hands. Q: I activate the effect of Destiny HERO – Diamond Dude, and a Superior Polymerization is sent from my Deck to the Graveyard. During the Main Phase of my next turn, if I activate the effect of Superior Polymerization and perform a Fusion Summon, can I then also activate its second effect from the Graveyard that Special Summons the Fusion Material monsters used for the Fusion Summon? A: In this scenario, if the effect of Superior Polymerization was activated after it was sent to the Graveyard by the effect of Destiny HERO – Diamond Dude, as long as the Fusion Material monsters used for the Fusion Summon are all present in the Graveyard, you can then activate the second effect of Superior Polymerization that Special Summons them. Q: Dragonic Diagram is face-up in my opponent’s Field Zone, and a Tribute Summoned Draius the Third, the True Dracogeneral is face-up on my field. In this situation, when Draius the Third, the True Dracogeneral would be destroyed by battle, will the effect of my opponent’s Dragonic Diagram be applied? A: The effect of Dragonic Diagram that prevents Tribute Summoned “True Draco” monsters from being destroyed by battle once per turn is applied not only to the controller’s monsters, but also their opponent’s. Therefore, in this scenario, when your Draius the Third, the True Dracogeneral would be destroyed by battle, the effect of your opponent’s Dragonic Diagram is applied and it is not destroyed. Q: Both players have Dragonic Diagram face-up in their Field Zones, and a Tribute Summoned Draius the Third, the True Dracogeneral is face-up on my field. In this situation, when Draius the Third, the True Dracogeneral would be destroyed by battle, how will the effects of each Dragonic Diagram be applied? Q: I activate the effect of Dragonic Diagram that destroys another card on my field or in my hand, and adds 1 “True Draco” card from my Deck to my hand. If I choose a face-up Different Dimension Dragon on my field as the card to destroy, how does the effect resolve? A: Different Dimension Dragon is not destroyed by the effects of Spell/Trap Cards that do not target it. As in this scenario, if you choose it as the card to destroy with the effect of Dragonic Diagram, since it is not destroyed, you cannot add a “True Draco” card from your Deck to your hand. Q: My opponent activated One Day of Peace, and its effect that prevents either player from taking damage is applying. If my Kabazauls equipped with Spiral Hold of the Phantasmagoric Dragon destroys an opponent’s monster by battle, can I activate the effect of Spiral Hold of the Phantasmagoric Dragon? A: Even while the effect of One Day of Peace is applying, you can activate the effect of Spiral Hold of the Phantasmagoric Dragon when the equipped monster destroys an opponent’s monster by battle. In that case, the parts of the effect that Special Summon a Spiral, the Phantasmagoric Dragon from the hand, Deck, or Graveyard, and equip with with that Spiral Hold of the Phantasmagoric Dragon, are applied normally, but the 1000 damage inflicted to your opponent becomes 0 due to the effect of One Day of Peace. Q: While the effect of Dark Simorgh is applying, can I activate Revolving Stage? A: If Dark Simorgh is face-up in your own Monster Zone, you can activate Revolving Stage. However, if Dark Simorgh is face-up in your opponent’s Monster Zone, you cannot activate Revolving Stage. Q: Zoodiac Hammerkong and Zoodiac Lyca are face-up on my field. In this situation, I activate the second effect of Xiangke of the Zoodiac from my Graveyard, targeting both Zoodiac Hammerkong and Zoodiac Lyca. If my opponent chains Book of Moon, and changes Zoodiac Hammerkong to face-down Defense Position, how does the effect resolve? Q: A Spiral, the Phantasmagoric Dragon, and a Spiral Serpent equipped with Spiral Wave of the Phantasmagoric Dragon, are both face-up on my field. In this situation, I activate Odyssey of the Phantasmagoric Dragon from my Graveyard, targeting Spiral, the Phantasmagoric Dragon, but my opponent chains Book of Moon and changes Spiral, the Phantasmagoric Dragon to face-down Defense Position, how does the effect of Odyssey of the Phantasmagoric Dragon resolve? Q: I activated Supremacy of the Phantasmagoric Dragon, and its effect is applied to my Spiral, the Phantasmagoric Dragon. If that Spiral, the Phantasmagoric Dragon attacks my opponent’s Effect Monster while equipped with Spiral Crash of the Phantasmagoric Dragon, Spiral Hold of the Phantasmagoric Dragon, and Spiral Wave of the Phantasmagoric Dragon, but my opponent activates Imperial Order and negates the effects of those Equip Spell Cards, does this still count as one of the three Effect Monsters that Spiral, the Phantasmagoric Dragon has to destroy by battle for the victory condition to be met? Q: I activated the effect of Cradle of the Destruction Swordsman from my Graveyard this turn, which prevents “Destruction Sword” cards on my field from being destroyed by battle or card effects. In this situation, if a Buster Whelp of the Destruction Swordsman on my field is attacked by an opponent’s Mystery Shell Dragon, and my opponent activates Forbidden Lance to make Buster Whelp of the Destruction Swordsman unaffected by Spell/Trap effects, will the effect of Cradle of the Destruction Swordsman be applied? A: In this situation, when your Buster Whelp of the Destruction Swordsman battles your opponent’s Mystery Shell Dragon, since it is unaffected by the effects of Spell/Trap Cards, the effect of Cradle of the Destruction Swordsman is not applied. Buster Whelp of the Destruction Swordsman is destroyed by battle normally. Q: During my turn, if I activate a Field Spell Card from my Deck using the effect of Pop-Up, will the effect of Ancient Pixie Dragon to draw 1 card activate? A: Even if a Field Spell Card is activated during your turn by the effect of Pop-Up, the effect of Ancient Pixie Dragon will activate in a new Chain. Q: My opponent has Fairy Tail – Cinderella equipped with United We Stand face-up on their field. In this situation, can I activate the effect of Power Tool Mecha Dragon that equips an appropriate Equip Spell Card on the field to it? Q: When the effect of a flipped Ryko, Lightsworn Hunter is activated, Book of Moon is chained, and Ryko, Lightsworn Hunter is changed to face-down Defense Position again. When its effect resolves, if Lightsworn Judgment is sent from the Deck to the Graveyard, can I activate its effect that adds a Judgment Dragon from my Deck to my hand? A: Even in this scenario, Lightsworn Judgment is considered to have been sent from the Deck to the Graveyard by the effect of a “Lightsworn” monster, so you can activate the effect that adds Judgment Dragon from your Deck to your hand. 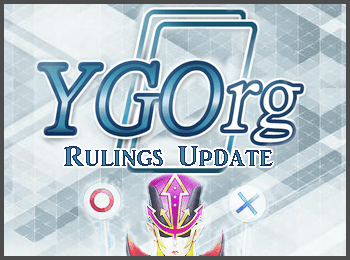 Q: Thunder King Rai-Oh is face-up on the field, and its effect that prevents players from adding cards from the Deck to the hand except by drawing is applying. In this situation, can I activate Conscription? A: Even if the effect of Thunder King Rai-Oh is applying, you can activate Conscription. If the excavated card from the top of your opponent’s Deck is a monster that can be Normal Summoned/Set, it is Special Summoned as usual. If the excavated card is a monster that cannot be Normal Summoned/Set, or is a Spell/Trap Card, it is sent to the Graveyard since it cannot be added to your opponent’s hand.